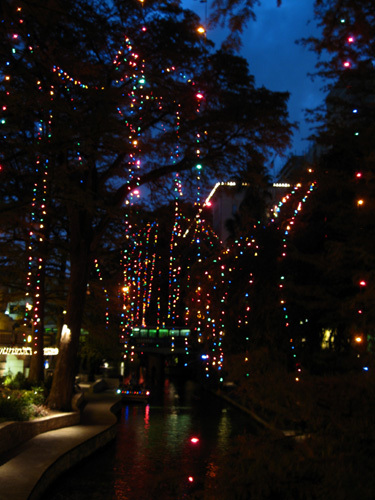 "The city of San Antonio will soon be bustling with shoppers from around the world coming to see the spectacular display of lights and holiday cheer. 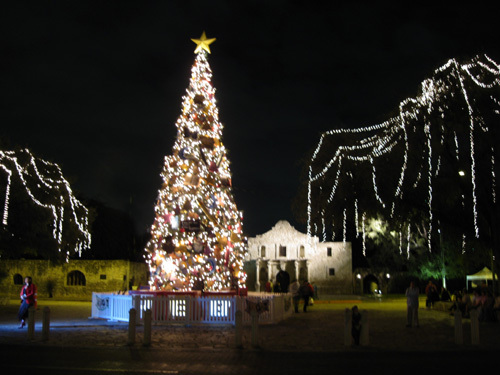 The city's holiday decorations are unlike any other city and it all begins with the lighting of a giant Christmas tree the day after Thanksgiving at the Alamo." 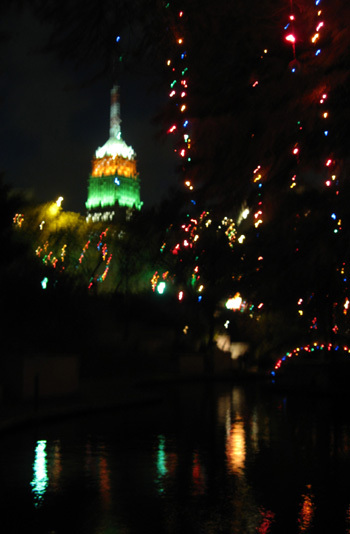 We had a such a great time visiting San Antonio in late January, 2008 that we wanted to go back in December to see the holiday lights we read about. The timing is perfect on this trip -- we are heading toward Phoenix and San Antonio is right on the way. Funny thing, though -- we forgot about the lights until reading an article about the spectacle in the newspaper when we were camped at Fort Hood recently. We almost missed it! We decided an overnight stay would be sufficient since we want to get to Phoenix soon. We lucked out and got a reservation with not much notice at the Fort Sam Houston family campground, where we stayed in January. It's a popular place that stays pretty full all winter. We left Huntsville State Park this morning for the four-hour drive to San Antonio. The first challenge was getting around the sprawling Houston area without going all the way downtown on 1-45 to I-10 or using the annoying stop-and-go "outer belt" (Routes 6 and 1960) around the NW side of the city. That left Houston Tollway 8. How difficult could that be? The weather was good and traffic was flowing well at 10 AM. Too well. Soon after entering the tollway Jim got into the left lanes marked for "trucks and trailers" (that's us, right??) and couldn't get out when we reached the toll booth area. No one was stopping to pay. Unfortunately, we were forced to sail through an E-Z Tag lane reserved for vehicles with prepaid optical scanners. We realized much too late that we were in the wrong lane. Uh, oh. We figured we got captured by a camera and any minute would be pulled over by a police officer for failure to pay our toll. We didn't know whether to get off at one of the exits and return via another booth where we could come clean or keep going and pay the piper later. We kept going until we got to another booth. The nice lady there said we could only pay forward for the next segment to I-10, not what we'd missed. She gave us an E-Z Tag brochure and said to call the business in two days, when they'd be processing today's absconders (she didn't use that word!). We still didn't know how big of a fine we'd surely have to pay until Jim got in touch with the office a few days later. Turns out, you get one free pass. Well, not exactly free -- we have to pay the $4 toll -- but first-time "offenders" aren't fined. Whew. But watch out if you do it again, they warned. Next time we drive from Huntsville to San Antonio or vice versa, we'll just go the "free" freeways through Houston and deal with the traffic. The rest of the 255-mile drive to San Antonio was uneventful. We got diesel at Flying J for $2.39/gallon on I-10 west of Houston and found it a little cheaper in San Antonio. It's great that the price keeps going down! Construction around Fort Sam on the east side of San Antonio is about as bad as northern Houston. We found our way OK into a different gate on post. Our instructions were better this time than last January when we were literally going around in circles hunting for the correct entrance gate to get to the campground. That gate is closed now because of the 1-35 construction. What's this? A sign on the door said the restaurant was closed for an employee party. Rats. 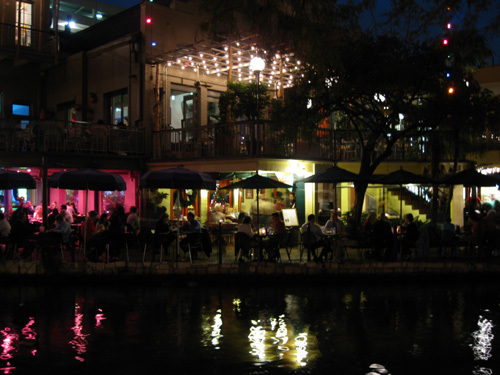 That turned into an advantage for us, however, because we found another Mexican restaurant a few hundred feet up the river that we liked better: "The Original Mexican Restaurant and Bar," they call themselves. Why "original?" 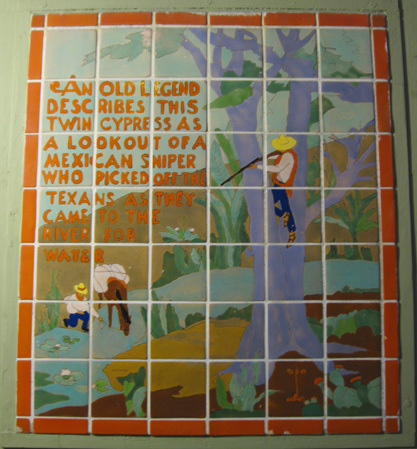 "The rest are really Tex-Mex," the host explained. "Please don't feed those cute, begging ducks. The fat on tortilla chips is bad for water quality." Which made me shake my head and say to Jim, "The heck with the water!! What about ducks' and people's arteries??!!" But that's another journal entry entirely. Cute, begging ducks cluster around one of the restaurants along River Walk, hoping for handouts. We both had tasty enchilada dinners. Mine were filled with chicken breast meat and topped with mole sauce. Now I'm in the mood to fix that chicken chili mole recipe I found in Phoenix last winter! I brought the recipe with us. The trick will be finding chipolte-flavored cheddar again; that made the dish taste extra special. The only place we've seen it was at a Costco in eastern metro Phoenix. We no longer have a Costco membership (only because the closest Costco to Roanoke is two hours away) and Sam's Club may not carry it. It's worth the hunt. 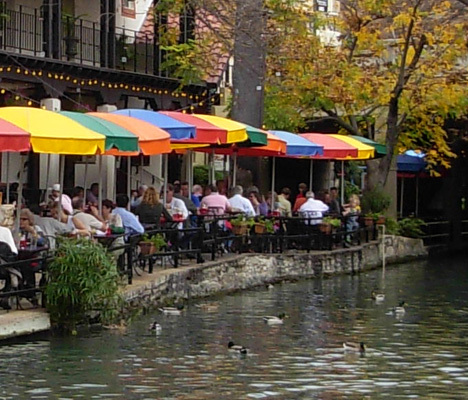 Anyway, we recommend The Original Mexican Restaurant and Bar over Casa Rio if you're dining at River Walk in San Antonio someday . . . our dinner choices really were more authentic. The sky darkened as we ate our dinner and the lights began to twinkle. I don't know exactly what I was expecting, but it wasn't long strands of blinking colored lights hanging a hundred feet or more from the trees towering over the river. The effect was mostly striking, however. This is where I need to apologize for the photos that follow. 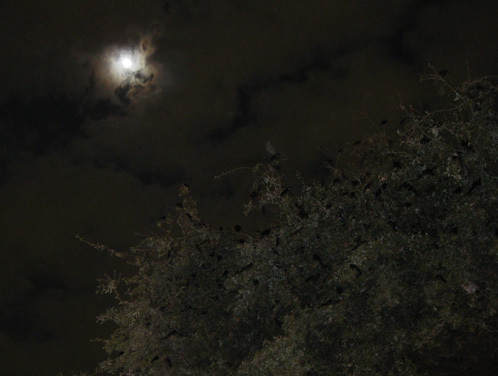 I took them with a new camera that I'm neither very familiar with nor entirely pleased with. Even if I was, a tripod is needed to get proper photos in the dark -- especially when most of the lights are blinking on and off. Instead of a night-time setting I maybe should have used a "sports spectator" type of setting that takes multiple shots per second. We wandered the entire length of the U-shaped River Walk on both sides of the river. What a crowd! It was a clear but chilly Monday night, and I couldn't believe how many people were walking around. There were times when I was on the river's edge and was concerned about being accidentally nudged off the narrow stone path into the water. It's only about three feet deep, so no one's likely to drown if they fall in. But it would have been mighty chilly and inconvenient! 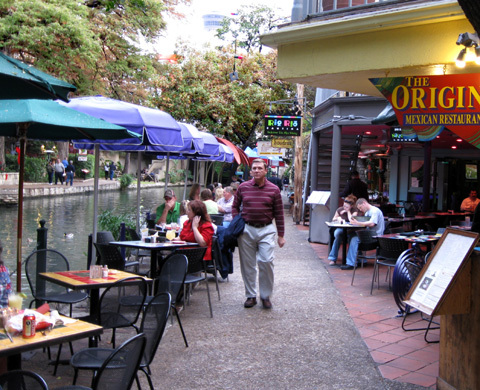 We finally ended up going in the direction where the folks on the right were on the store/hotel/restaurant side of the pathway, not the river side. Just about everything that's stationary along the river was decorated with lights. 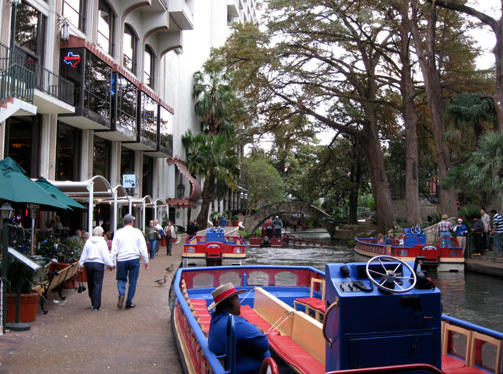 So were the riverboats, some of which were filled with musicians and carolers. That was a nice touch. 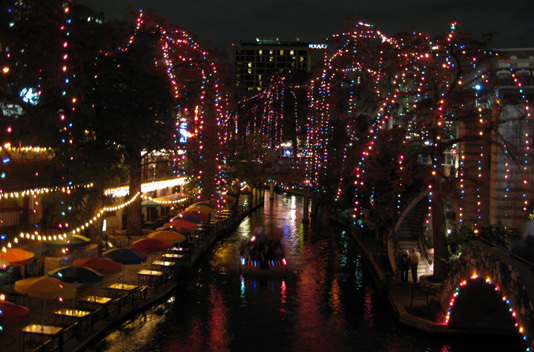 I loved the visual and auditory delights of walking along the river: multi-colored lights reflecting on the water, thousands of people laughing and talking in various languages, carolers and musicians entertaining us from boats floating by, hundreds of birds singing from the tropical foliage of palm trees and flowering shrubs. It's not the type of "winter" to which we are accustomed! 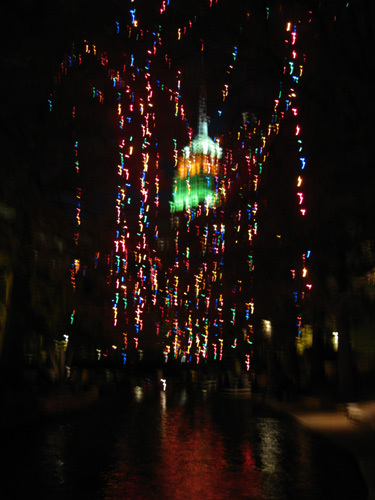 After spending about two hours walking along the river we climbed back up to the street level and walked a few blocks to the Alamo, site of a very tall Christmas tree. 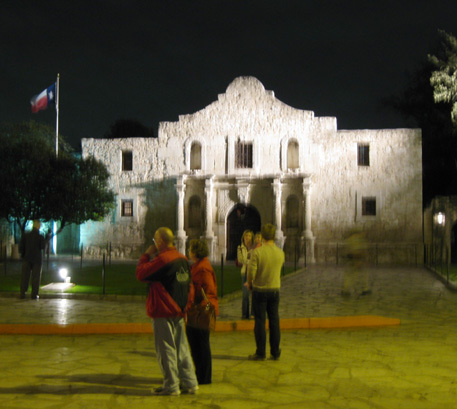 Click here for shots of the Alamo that we took during the daytime last January. The buildings were closed tonight. 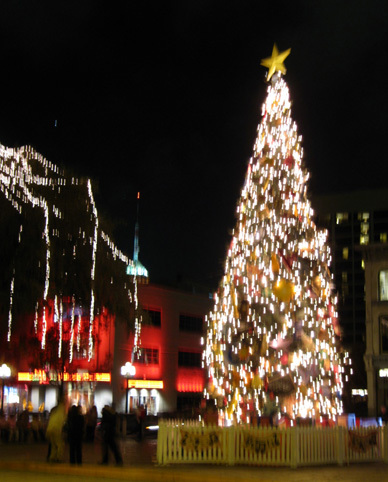 Many other historical sites, city parks, and other areas throughout the city are decorated for the holidays. 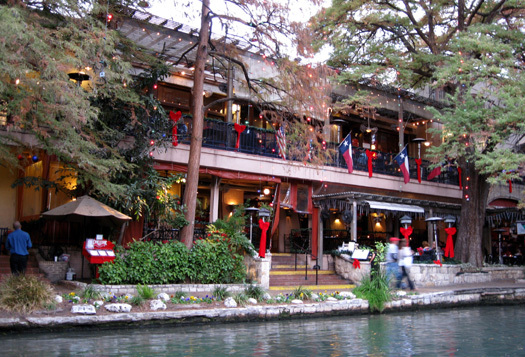 We were satisfied to go back home (to our camper) after seeing River Walk and the Alamo. 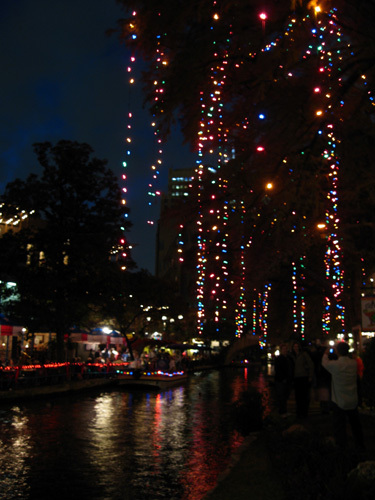 Another year we'll check out the lights in other areas of the city including Market Square, the country's largest Mexican market. Next entry: on the road to Phoenix.